Whoa! POSITIVE SENSORY OVERLOAD here! 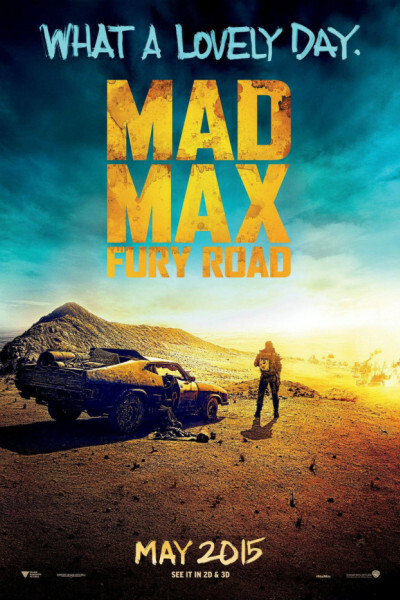 Mad Max: Fury Road delivers the insane goods, and then some. Filmed in Namibia, Australia and Cape Town, it's a wild riding "western on wheels" that has been on the drawing board since 1998, derailed by 9/11, funding issues, Mel Gibson's bad behavior, and the death of its then-intended star, Heath Ledger. However simple the plot (get from here to there...alive), it feels enormous: intense, fast, nearly nonstop from scene one to credit crawl. Theron, Hardy, and Lenny Kravitz's daughter, Zoe, are fine—but this could have starred nearly anyone and done well; the complexly choreographed action is the lead. The score is awesomely zany, spectacularly loud and momentous. Lots of weird guitar riffs throughout and spaghetti-western-type orchestral arrangements. Too many bizarre characters to mention here; stay through the credits to see them listed. A krazy-fun film. On the three occasions—each lasting no more than 5-10 minutes when the action pauses ever so briefly just so you can catch your breath and experience dialogue (which is as sparse as gas and water)—the audience giggled nervously and gasped with audible "whoas!" as we caught up with the pace and visual feast. There's kodo-style war drumming, en route guitaring (poor little dude suspended in air, strapped before a wall of two dozen concert speakers, rallying the caravan en masse), huge fireballs and smoky fireworks, Evel Knievel dirt biking, monster trucking, 30' pole-fighting, Cirque de Soleiling, gun fighting, knife fighting, nursing, renegade "breeders," you name it. Like I said, it's gonzo mayhem, man! Nearly everyone sat riveted through to the credits, and the film ended with applause from several enthusiastic acolytes. It's just a flat-out circusy blast and instant cult classic. Afterward, I asked the employees what sort of response it's getting and heard a chorus of, "Everyone loves it, dude! Can't take their eyes off it!" No language (one bad word), no "intimacy," just a 7-second weird nursing scene (think "Aliens" meets Jabba the Hutt at a blood bank for milk), and constant cartoony violence, which is quirky and Kool with a capital K.
The film earned over $15m just YESTERDAY (Thursday) and is garnering 5 stars everywhere, a score of 89 on Metacritic, and 8.8/10 on Rotten Tomatoes. I could go on and on, but I'd say if you're 15 or over, male, and dig petrol and pistols, it's a must-see for the ol' oeuvre.